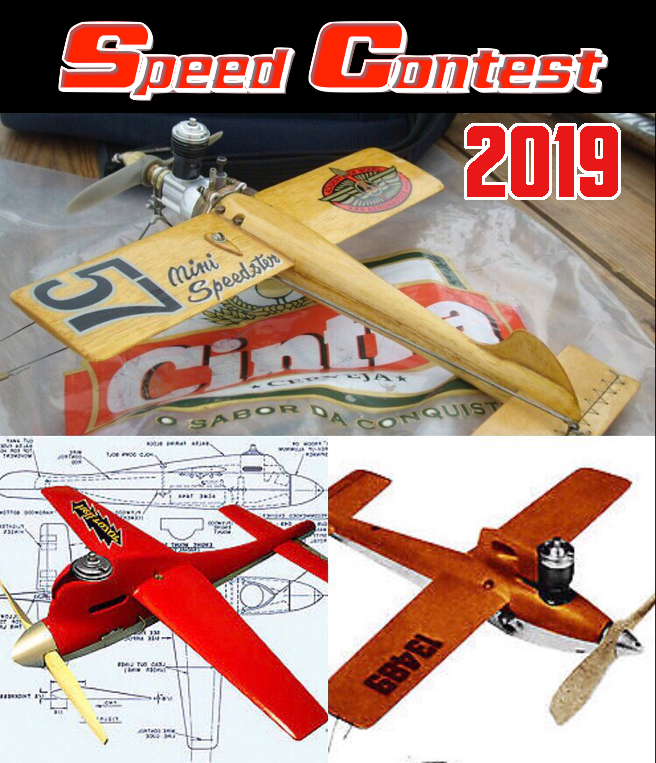 Any interest in a single design speed contest using the Dale Kirn Torky. No prizes just post your video on line for bragging rights? The rules would be build a Torky with a tee Dee .049/.051, 42' lines ten laps timed from rolling takeoff? Jim, I would be very interested in giving this a go. I'm still currently trying to get mine finished. This was the picture I posted about a month ago and really nothing much has changed aside from several coats of dope. It has the Kirn Kraft bellcrank as well. The plan calls for a left-hand TeeDee. I noticed the same thing on the lovely little bipe, the Torquette. What kind of modifications (if any) are necessary to use a "normal" TeeDee or Medallion? Increased tip weight maybe? 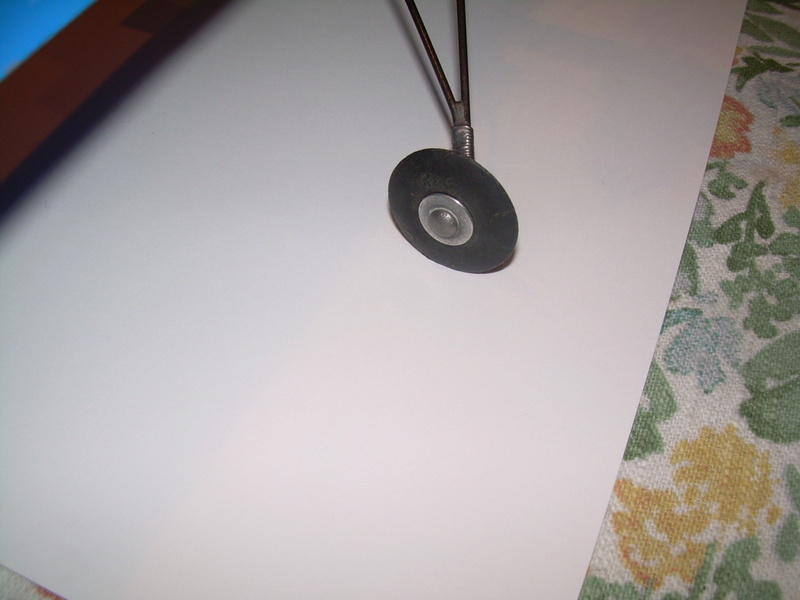 Tip weight is eliminated via left hand rotation. KariFS wrote: The plan calls for a left-hand TeeDee. I noticed the same thing on the lovely little bipe, the Torquette. What kind of modifications (if any) are necessary to use a "normal" TeeDee or Medallion? Increased tip weight maybe? Yep, just tip weight. Or as Phil suggested fly clockwise. Maybe it could be a Torky/Tourqette contest? I would say leave the time open ended, just kind of an ongoing thing. Again no official contest with timers and prizes just post your video for bragging rights. As you get faster times post another video. I saved the photo of the plan and just looked at it. 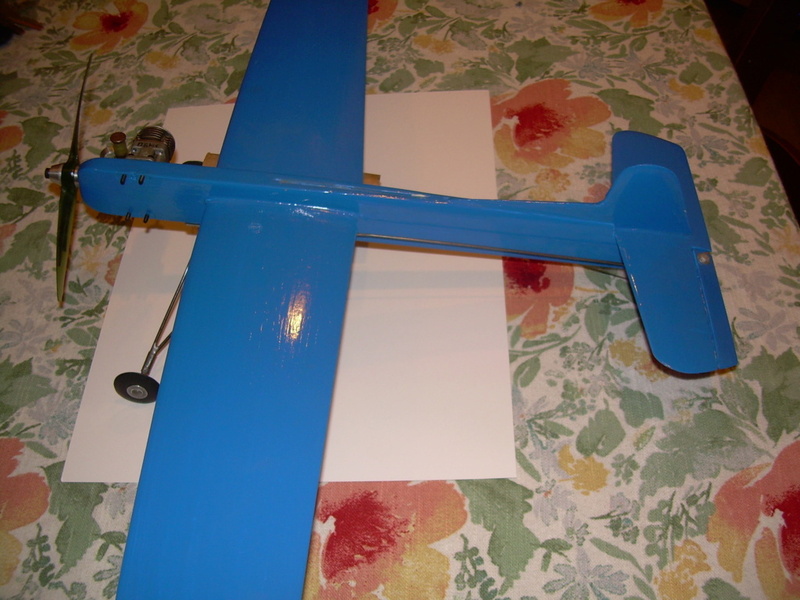 Roughly scaling the wing.. it looks to be 16" span and about 50 sq. in.? The tank layout is pretty small.. looks to be maybe 5cc's? 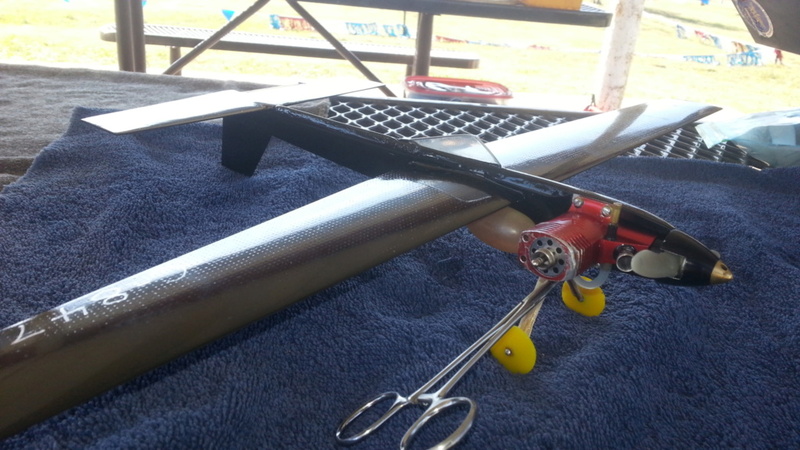 Ken, did you cut and shape the whole wing.. or use one of Sig's airfoil panels? So maybe, but likely not this year. Thanks Ken. I have pretty much everything needed to build this little screamer. 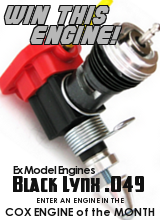 Are the recommended .050" aluminum engine-plates necessary.. and is that what you used for the LG plate? 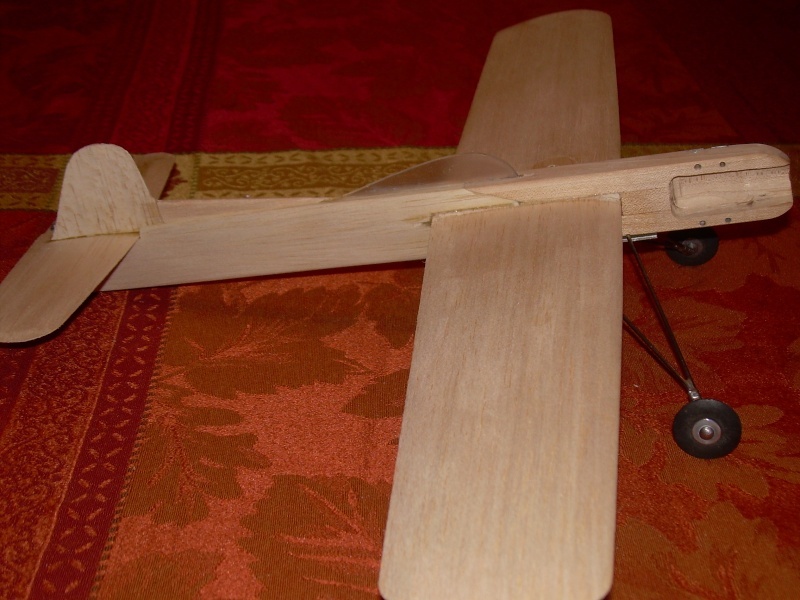 The angled joint where the 1/2" maple engine-bearers meet the 1/2 balsa fuse looks tough to fit. Easy fit. Full thickness, same as the bearer. Cut the bearer first, leave it long by 1/4 inch or so, cut the fuse to match use a two sided sanding block to fit if necessary. The actual angle is less important than the fit. How do you know if you have a right handed or left handed TD? Easiest way is to pull the venturi off so you can see the crankshaft. 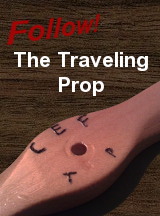 Have a prop on it and turn the prop counterclockwise (right handed prop). You should see the rectangular slot in the crank rotate below the venturi hole before the piston gets to Top Dead Center. If the piston reaches the top of the compression stroke first, then it's a left handed crank. Thank You Ken. I figured that you may have used a band-saw to make those cuts. Yes.. the Torquette's aluminum plate design is definitely over-kill. The whole Torky "front-end" has got me scratching my head though. I'll have to study the plan and the photo of your model more. I have a piece of 1/2" x 2" x 24" maple that I can rip down.. but apparently there's two widths (3/8" and 1/2") required? This is where I'm confused. I also have a piece of 1/2" x 2" x 24" poplar.. which is slightly lighter in weight. Could poplar be substituted in place of the maple.. or is it too soft? Thanks again Ken. I'll have to remember that about the poplar. 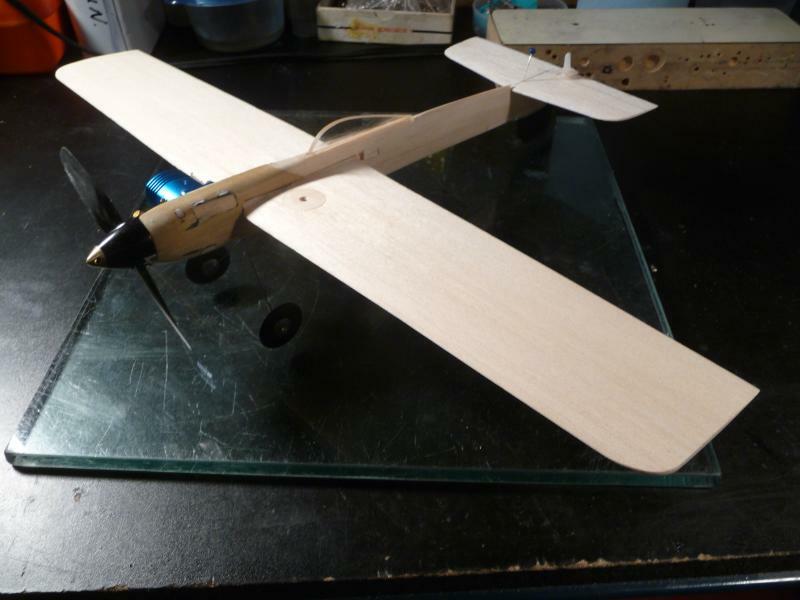 I do have a piece of 1/2" balsa.. but may opt to laminate two pieces of 1/4" if I decide to start building.. which I really should. A very good friend recently gifted me 6 different 1/2A cl. front rotary-valve engines.. including a Tee Dee .049 and .051! My very first Tee Dees! If hard maple (not soft maple) is hard to get (Brodak stocks it) cutting up flooring that is maple or white oak or shipping pallets for white oak will provide good pieces. Just be careful if you decide to tear into a pallet, the nails...the splinters...ugh. I'm going to build one by October and post video here, I hope I'm not the only one. What a neat idea and an excellent tribute to the designer, Dale Kirn! I would enter EXCEPT my attempt at a TORKY morphed wildly out of control when I decided to upgrade the engine to a Shuriken. and the takeoff was so smooth and stable that the pilot could actually have his/her wrist in the speed pylon without having the model roll in on them on takeoff. 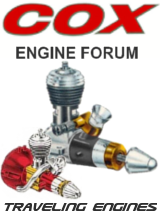 The question was asked as to what should one do IF he doesn't have a L/H engine & prop & wants to go with the normal rotation engine. The hardest / easiest option is to fly the model the other way around. i.e. Clockwise. Then you have all the good characteristics but need to be able to fly the other way from normal. I've done it, but it takes a bit of practice...because it is a strange way to fly. The other option is to try it with the normal rotation. I would certainly suggest using 1/3 oz tip weight (if not more for a start). 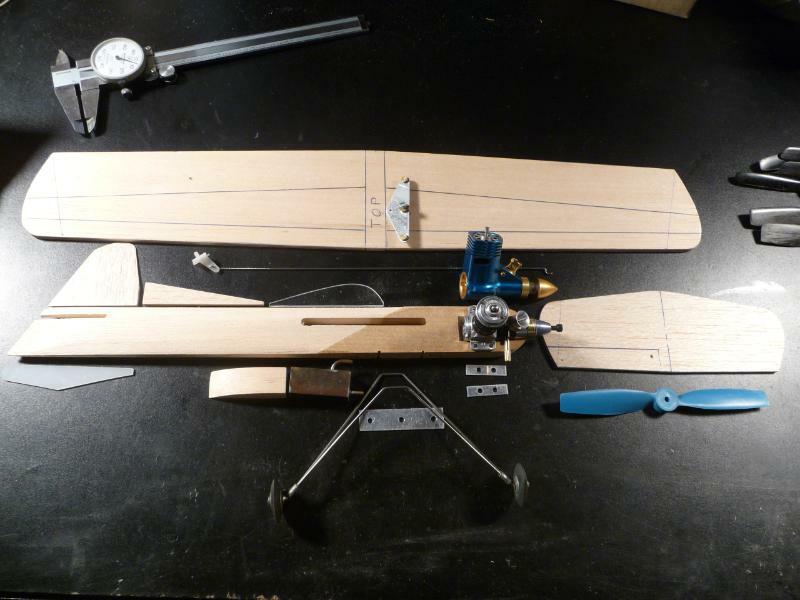 You can gradually reduce the tip weight after initial flights until such time as the takeoff becomes dicey/slack on the lines and wants to roll in on you. This loose line condition can be helped by also sweeping the leadout position aft of what is shown on the plan. It's best to have several holes in your leadout guide so that you can gradually sweep the leadouts forward until the model wants to roll in on you again, then go back one hole. 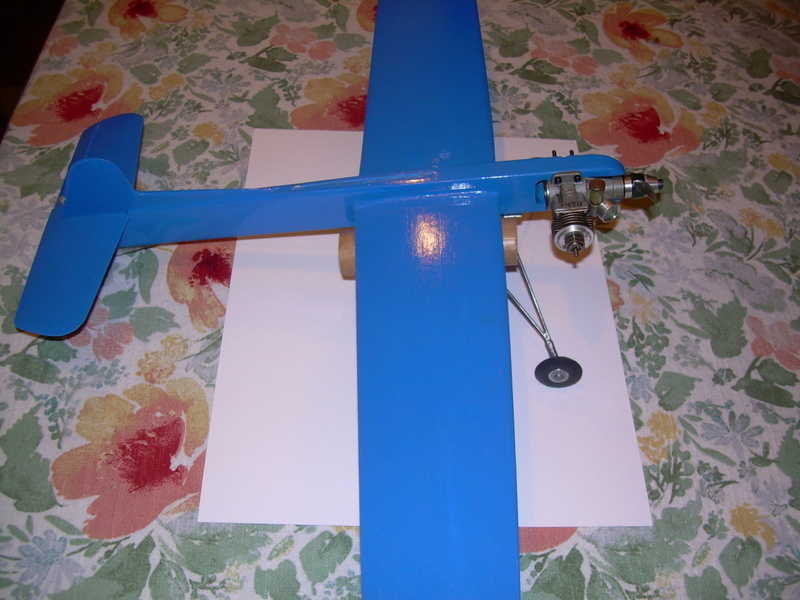 What is working against you with a normal rotation engine is that top rudder. 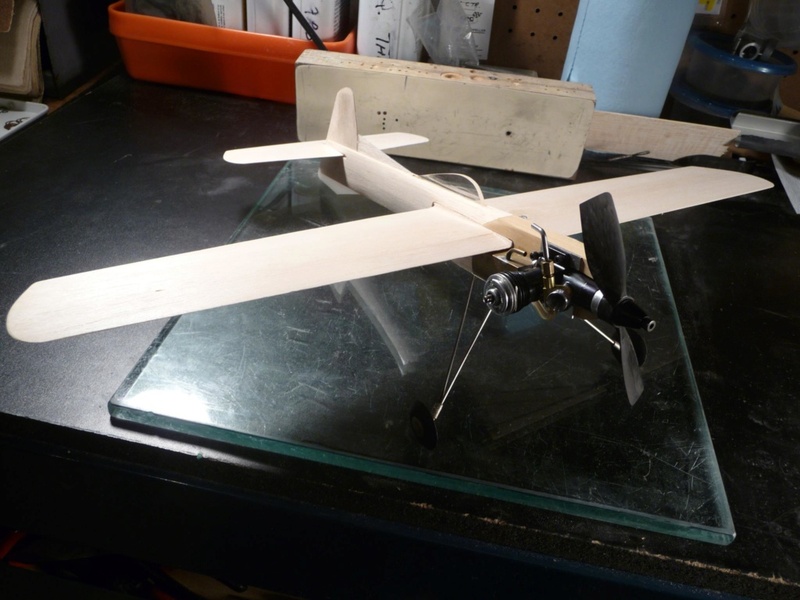 Placing that top rudder on the bottom will do a world of good on takeoff. This is why all the top AMA proto models have sub rudders. That was found out after a lot of crashes/roll-in's on takeoff! 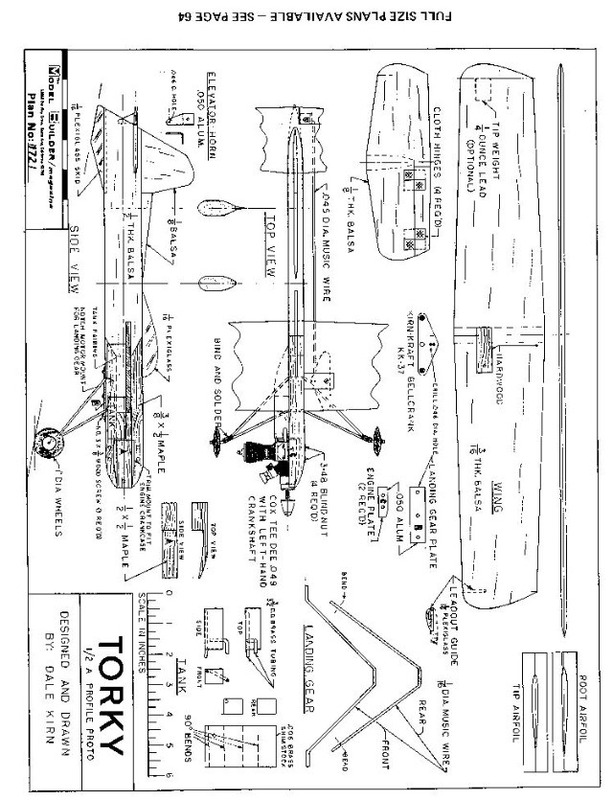 But with a sub rudder, then the model wouldn't look like a TORKY anymore would it?? So there you go. As in life, often compromises have to be made. In any event guys, HAVE FUN!! p.s. 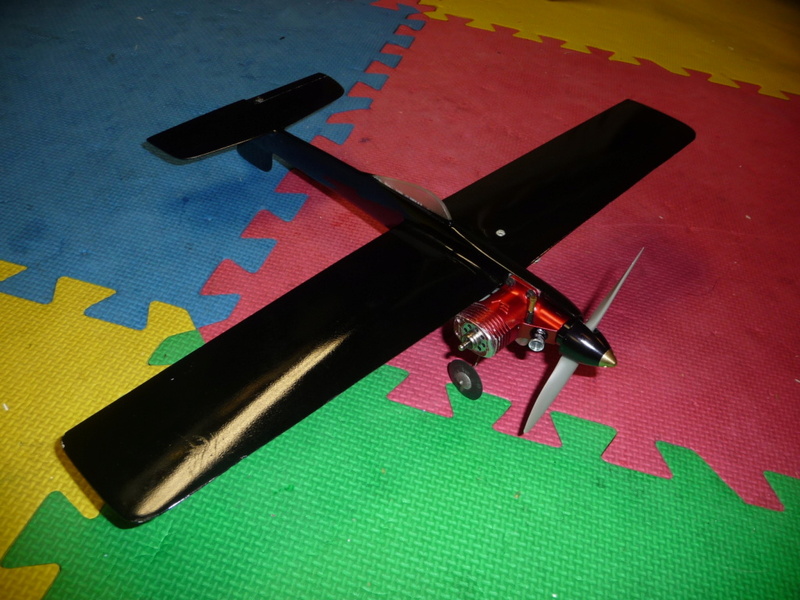 My modified Torky, weighs less (5.25 oz) & goes faster (97+ mph) than the original plan, but I've learned a few things since that plan was published. Not Cox powered but could be as the Norvel shares the same mounting . I plan on one of my TD's as I have built a very neat little coffin tank for it. Seeing some of your Shuriken's Paul makes me want to use some of mine. Nice TORKY model you have there! Do you happen to have a weight for it ready to fly less fuel? I notice what appears to be a bladder tube under your wing.